This entry was posted in Blog Reimagining the Urban - September 2013 and tagged Reimagining the Urban we us aesthetic staging on December 17, 2013 by arc_berkeley. When Linda Rugg spoke of how “we” define ourselves in relation to the bay, who are the “we” to whom she refers? When Brad McCrea said that the bay is different for “us” as it was then compared to now, are these generations of people in the past and in the present even the same entity? What if some family, previously included in the “we” during the 1970′s, moved away from the bay area in the 2000′s? ; would the “we” be substantively changed or does the “we” persist to inscribe those who no longer belong to an area but identify themselves as having once come from it? What would justify an invocation of the “we” to transcend a specific temporal collectivity and ideology? I just moved to the bay area. What justifies me to take claim over the bay as my home, and my inclusion in the “we” of the bay area? This entry was posted in Blog Reimagining the Urban - September 2013 and tagged Reimagining the Urban photostream on December 17, 2013 by arc_berkeley. 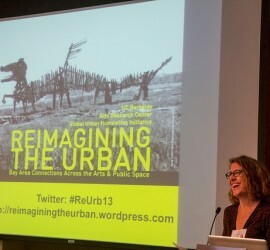 As part of the ongoing campus initiative Global Urban Humanities: Engaging the Humanities and Environmental Design, the Arts Research Center co-sponsored the Reimagining the Urban: Bay Area Connections Across the Arts and Public Space on September 30, 2013. This entry was posted in Blog Reimagining the Urban - September 2013 and tagged Reimagining the Urban revitalization gentrification on December 17, 2013 by arc_berkeley. Kicking off the Reimagining the Urban symposium, Margaret Crawford spoke of a real estate development boom in San Francisco that has contributed to an exodus of roughly 10,000 artists from the city. This familiar narrative is one of rising real estate prices forcing the working classes out of neighborhoods such as the Mission while yupsters move in, bringing with them expensive restaurants, high-priced boutiques, and exclusive national chains. A similar process is occurring on a larger scale in the Mid-Market area, where over40 active real estate projects will bring several million square feet of new office, residential and retail space—not to mention new entertainment and dining options—into a previously “seedy” neighborhood.